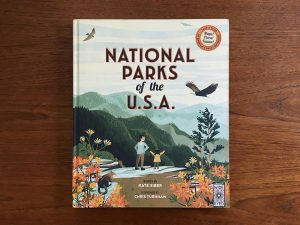 In this large-format children’s book (ages 6-10), discover the beauty and diversity of America’s great outdoors in a grand tour of its most iconic national parks. Explore Florida’s river-laced Everglades, travel down the white water rapids of the Grand Canyon, trek across the deserts of Death Valley and scale the soaring summits of the Rocky Mountains with this book that brings you up close to nature’s greatest adventures. Packed with maps and fascinating facts about the flora and fauna unique to each park, this fully-illustrated coast-to-coast journey documents the nation’s most magnificent and sacred places—and shows why they should be preserved for future generations to enjoy. Pick up your copy at Maria’s Bookshop, my favorite independent bookstore at 960 Main Avenue in Durango, Colorado!